Everyone is all about resolutions. Lose weight, learn to cook, relax more. My favorite resolution is working on your home. Whether you plan to re-do an old piece of furniture to make it stand out in your abode, or you just want to create a better space for your family to dwell in this winter, working on your home is one of the greatest resolutions you just might be able to keep. Want to burn a candle but don’t want the danger of a fire going? Use the stovetop again and place your candle in some simmering water. It will melt the wax, and amplify the smell. I love using the Febreze Cozy Vanilla Sugar candle for this. Such a relaxing smell. Bonus? Once your done, the wax will just harden back up and you can do this over and over without using up the candle! Use scented plug-ins in high traffic areas and bathrooms. These are the areas where your guests will most likely be spending time, so make sure they smell decent. I’ve been a big fan of Febreze products. They last and last, and for this frugal shopper, stores are constantly offering great sales on them, and their coupons run rampant! With new seasonal scents like Cranberries and Frost, Winter Magic and Glow, and (my favorite) Cozy Vanilla Sugar you’ll be able to find your own home’s signature scent. Also, Febreze wants to offer one 4 Hats reader some goodies! $15.00 Visa gift card to go on a scent shopping spree! Feeling lucky? 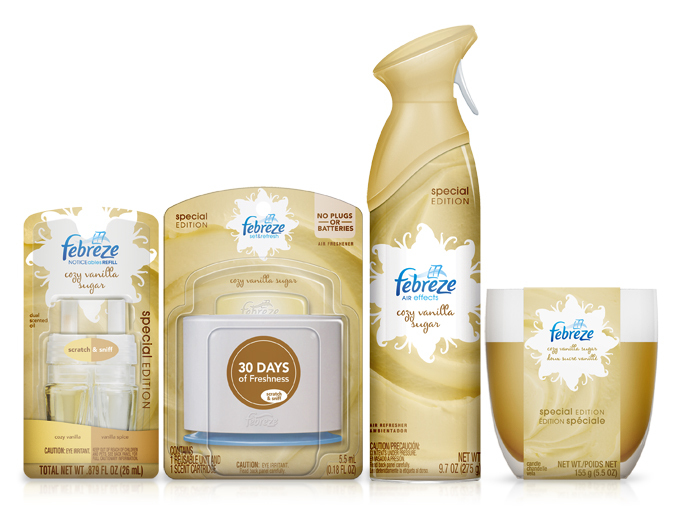 Take a look at the Febreze Website, and comment below which scent would fit your home perfectly. Make sure that you leave an valid email address so I can contact you when you win. This will be weekend giveaway, ending on Monday, January 7th at 11:59pm. The winner will be announced on the 4 Hats and Frugal Facebook fan page on Tuesday, January 8th. 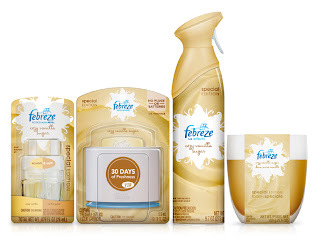 Disclosure: The Frebreze product, information, and gift packs have been provided by Febreze. I was sent product in exchange for this blog post.